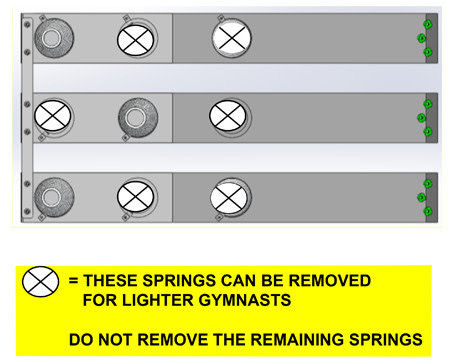 AAI is now recommending the use of AAI vault boards with fewer springs for Level 4 gymnasts that weigh less than 80 lbs. As few as 3 springs on either the Stratum Vault Board or the TAC/10 LZT Vault Board are now acceptable. However, ensure that the two front corner springs (high side), as well as the center spring in the middle row, stay in their original position as you can see in the following diagram. There are eight spring positions available on the board. Each board ships with 6 large springs and 2 small springs (8 springs total). The number of springs and their positions can be adjusted to meet the needs of the gymnast’s weight and ability. In this gymnastics equipment video, we will show you how to insert and remove springs into your AAI Stratum Vault Board or TAC/10 LZT Vault Board.